The world's first Thunderbolt LTO-7 tape drive supporting LTFS drag and drop backup and archiving as well as support for industry leading backup and archive software from manufacturers. mTape is an external LTO-7 tape drive providing connectivity to Mac and PC workstations over Thunderbolt. Includes YoYotta ID LTFS software bundle for all your back up needs. Featuring two 20Gb Thunderbolt ports, mTape supports daisy-chaining of up to six Thunderbolt peripherals to a single host. In additional mTape features a 4-port 6Gb SAS expansion connector enabling additional tape drives or SAS devices to be connected to workstations or laptops over the same Thunderbolt connection. 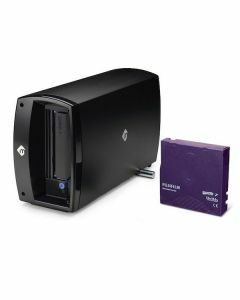 LTO-7 allows for data transfer rates of up to 300MB/sec to media cartridges holding up to 6.0TB per tape, or up to 15.0TB through compression*. The Linear Tape File Systems (LTFS) is fully supported by mTape, enabling users to treat LTO media like traditional storage mediums such as hard disk drives with drag and drop backup, archive and restore functionality. For users of professional backup and archive software applications, mTape is compatible with most leading packages. Backward compatible with Read/Write LTO 6 cartridges and Read of LTO 5. YoYotta ID is a fast and secure software for the back up of digital media content to local and network storage. mTape revolutionises LTO, empowering users with the ability to easily connect LTO technology to portable, desktop and all-in-one computers that feature Thunderbolt connectivity. The inclusion of DC powering enables users to integrate mTape in to any environment be it an office, studio, film set or even a jungle! *subject to data type and supporting application. Thunderbolt connecting LTO-7 Tape Drive. Dual Thunderbolt ports enables daisy-chaining of peripherals. Supports the Linear Tape File System (LTFS) for easy drag and drop backup and archiving. Compatible with industry leading backup and archiving software. External 4-port 6Gb SAS (SFF-8088) connector provides SAS expansion for additional tape drives or other SAS devices. DC Power enables use in any environment. Compatible with Mac OS X and Windows with Thunderbolt hardware.